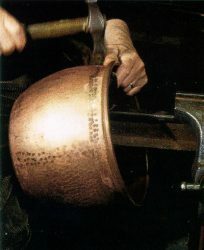 Nico Marin's copper pots are the result of a thorough research on the 1500's utensils. This enabled the rediscorevy of aesthetic and functional values, that fit very well with nowadays cuisine. The working method and the tinning of the inside, completely hand made, guarantee the quality of a product which combines an antique impression with surprising performances. 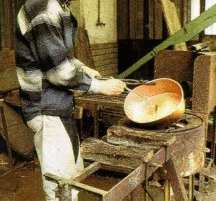 The first phase of Nico Marin's pot creation consists in pressing a copper sheet of great thickness (2,0-2,5 mm.) in a desired shape. This is obtained adapting a copper sheet on a mould through pression. 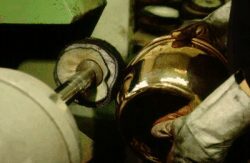 The excess material has to be removed from the rough form obtained through pressing, The outside surface of the pot has to be made even, paying great attention on carefully finish its edges. 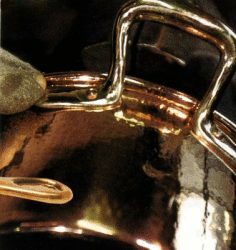 To have this done the pot surface is hammered, eliminating, in the meanwhile, all copper porosity which is either natural and due to the pressing phase (this is important to avoid the loss of heat, really preciuos during cooking). 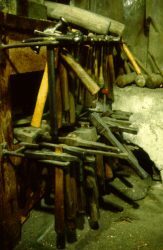 The hammering requires a wide range of tools, depending on the surface to work on. 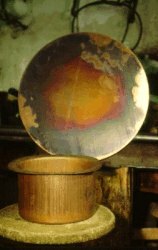 The final form of the pot has been obtained through the previous phases. 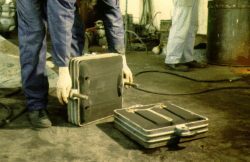 Next one is a very difficult operation: it is the tinning called "blazing fire". 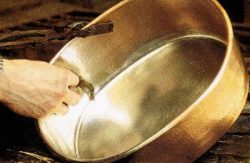 This method handed down from Renaissance period, consists in heating the pot on a open fire (blazing fire) and pour the pure tin into it. The tin is made uniformily adhere to the whole inside surface with a skein of raffia. A very strong cohesion between copper ant tin is obtained. For this the tinning can last for a long time. After the previous phases the pot is oxidized and has to be polished using disks of fabric rope and abrasive paste. This until the copper will unleash its reddish hues. The handles fusion is an operation complementary to previous ones. This fusion is called "fusion on earth" because to prepare the mould it is used a special earth for fusion. 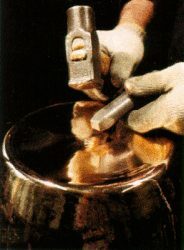 The molted brass is taken from the melting pot and poured into a mould previously prepared. 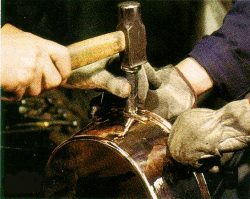 Once polished the pot, the holes for the copper rivets have to be prepared. 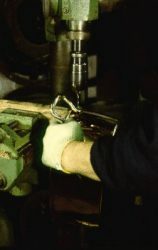 They are used to solidly join together the handles and the pot. The copper rivets are hammered with a hammer and a special punch. This method gives the handles a high durability. The Nico Marin's pot realization is finished. It remains nothing else to do than stamp on the pot bottom Nico Marin's trade mark.